Jo Redman joins the Anna Kennedy online team as a Patron! Today I am so different to the person I was several years ago – I still look the same, sound the same and have all the same interests but how I look at my life and how I view myself has completely changed. I actually grew up without a diagnosis and life was pretty difficult. I didn’t know why I struggled and felt different, my parents didn’t know why their daughter wouldn’t join in with other children and my teachers just looked at me as a quiet, good little girl. There was some amount of bullying at school, a lot of it was active isolation meaning they sought to leave me out but there was also name calling such as ‘spastic’ and ‘freak’. Some of the name calling was probably pretty standard for kids at that time but it had a much larger impact on me as I felt different already. Fortunately for me I never experienced any physical bullying at school, it was always other children laughing at my expense over something I had no idea why they were laughing such as my appearance. I would go through periods of not talking all through playschool, infant, junior and senior school – even into the workplace. Into my later school years things started to change around me more rapidly, I just got used to what my friends interests were and then suddenly they all changed into teenagers interested in boys, make up and pop bands. It felt hopeless, I had no interest in a lot of the activities they pursued and I didn’t know how to join in with this one. There were exams coming up and I didn’t know how to revise, I couldn’t concentrate on it. I became so anxious and down that my teachers noticed and there was a big fuss about it all. This is probably the point at which I should have been diagnosed but seeing how upset my mum was about the prospect of taking me to the doctors I begged her not to and tried to pretend everything was ok. I worked out how people expected me to act and tried to just be that, although it made me desperately unhappy and was very tiring! After I left school I had a massive shock going into the world of work. I had absolutely no idea how it all worked and I really don’t know how I managed to keep my first job. My first job was actually as a receptionist and I am someone who doesn’t really like using the telephone! I got through this job by creating my own processes on how I would carry out my work and answer the phone. At the time I didn’t know I was creating processes but looking back I can see that I did. I worked in an office with other women and there was always friction and I experienced some bullying here. It got to the point where I would walk into the office in the morning and certain people wouldn’t say ‘good morning’ to me like they did to everyone else. There were email conversations going on between others in the room, gossiping around the coffee machine, conversations stopping as I walked in and even my incoming emails were forwarded to them so they could see what I was ‘up to’. A lot of this behaviour started as I found things difficult. My mum was taken ill and eventually diagnosed with MS so I had a lot of stress in my home life, I was trying to keep it together for the rest of my family and I didn’t know how to handle the emotional impact of what was happening to my mum. It was only this situation started to settle down that it really affected me. I got so anxious about certain things, I struggled to verbalise things and would withdraw into myself and not communicate at all. It got to the point where enough was enough and I decided I needed to know why I felt so different and what was wrong with me, why couldn’t I do things other people were doing. I had a very good manager at work, who is now a very good friend, who supported me into going to the doctors. It took years and a crisis period for the mental health team to refer me for an assessment for Asperger’s Syndrome and to me when I was diagnosed it was the biggest turning point in my life. I felt so liberated to have the diagnosis because all these things I had worried about were no longer a mystery and as I learned about Asperger’s all the experiences in my past started to make sense to me. The psychologist who diagnosed me was so helpful to me, she said to me that the way I behaved, reacted and thought was not wrong but nor was it right, it was just different to how other people might behave, react and think and that that was ok. And at 23 years old that was the first time somebody had told me it was ok to just be me – that had a huge impact on me. Together with my husband who I’d met in sixth form, I learnt how I could ‘manage’ my life in a way that enabled me to do the things I wanted to do and since diagnosis I have done a lot of things. I almost run my life like a business, I have processes for all of the housework, I set objectives for everything I want to achieve and break these down into targets and then into tasks. I have a giant timetable I use to schedule all these tasks onto. I started kickboxing when I was 13 with my dad, he thought it would help my confidence. When I started I set myself three goals, to be a black belt, to fight for England and to be a World Champion. I have now successfully done all three. I use kickboxing to deal with any frustration, it is an outlet for me and when I am fighting it is the only place I feel at home and natural. I love it and basically live for it. It actually took me two years to actually speak to anyone at my kickboxing club but now I teach my own class, I have lots of the younger kids in our team look up to me, I run my club’s website and I’m one of the top fighters in the club. I have been as far as Canada to fight and that is an achievement for somebody who doesn’t really like travelling. My team mates all know I have Asperger’s and they accept me as I am, they know when to leave me be and kickboxing has really been one of the only places I feel I fit in. I struggle to cope in airports, something I didn’t find out until I was an adult as I’d never flown, so my husband has to accompany me everywhere I go which doubles the cost of competing on a world level. There is so much stress involved in competing for me, we eat out every night in restaurants, I’m happy within my group of team mates but sometimes it gets too stressful and I have to leave the restaurant. I used to hate standing on podiums with everyone looking at me but now having had 5 world medals I am used to it and it is now an awesome feeling to stand hearing your national anthem playing. There is the stress involved in travelling and in being in a crowded, noisy arena all day – a lot of these things even my team mates don’t always appreciate but I work out how to get enough time out and I love watching the fighting too so that helps to distract me. Kickboxing has given me discipline and also the attitude to never give up. 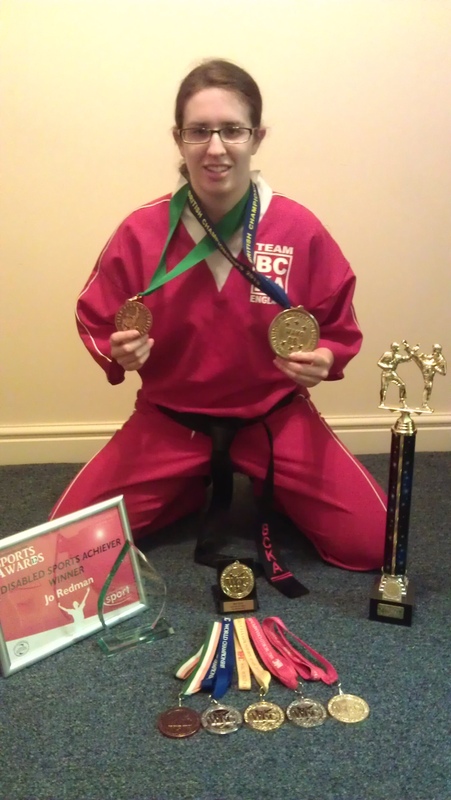 Just in 2013 I have won 2 British titles and beaten a tae kwon do world champion in a fight night. I have won bronze, 2 silvers and 2 golds at world championships. I also won Northamptonshire Sports Disabled Sports Achiever of the Year 2012. The success I have had in my sport has made me aim for that in other areas of my life. After leaving my first office job I had a couple of other jobs in offices but eventually decided it just wasn’t working for me. I didn’t enjoy it and I struggled a lot with it and so I made a massive decision to train as a sport and remedial massage therapist. This is something I would have dismissed doing years ago because of the social aspect of the job, however I am now someone who doesn’t see why I shouldn’t do something like that. I really threw myself in at the deep end and only disclosed my diagnosis once I had registered and paid for the course. I made things harder for myself with my competitive calendar mixing with study. I was in Canada for the first week of October winning my second world title and I was sitting my exams at the end of the October – a lot to do in one month. I also had a bad hamstring injury which had put me out of action for 3 months from May to August this affected my training and my massage study in that I couldn’t practise my massage skills. Combine all of that with having to fundraise every penny just to get to Canada…it was very stressful! But I did it all to the amazement of the tutors who had subtlety suggested deferring on my course, however I don’t give up and I was determined to succeed. I qualified and I’ve just started my own business which I’m finding a fun but stressful challenge. Through my massage (and facebook) I have also since met up with some of the girls who used to make fun of me at school and they were actually afraid to see me for fear I would use my kickboxing skills on them but I’d forgiven all that long before because I see no point in holding on to negative experiences like that. I want to grow and move forward and concentrate on what is happening now. Now I am friends with those people and respected for the things I do and the person I am – to me that is more positive then holding a grudge on someone over something they did as a child. Another change in me since diagnosis is in public speaking. I used to hate it, at school it took me over half an hour to stutter my way through a 5 minute speech we had to do in English. Even then I wouldn’t give up as my teacher had intervened asking me if I wanted to stop, however I carried on until the end reducing my teacher and some of my class mates to tears. Now I prefer public speaking to conversations, at least I have it all planned what I want to say. I have been into my local schools talking about my achievements which has been so beneficial for some of the kids who also have Asperger’s and those who don’t. They seem to get a lot out of it and that makes me happy. I have also been to charities and groups speaking to adults more about my story of Asperger’s and one of these even told me I was the best public speaker they had had which really pleased me given some of my history of struggling to verbalise things. I’m all about showing what people can do as opposed to what they can’t. I want to use my achievements to inspire others to have dreams and succeed, remembering I decided I would be a world champion at 13 and I didn’t achieve that until I was 25. There are so many things people with Asperger’s and autism can bring to society and that they can do especially with the right support and opportunity. I feel fortunate to have had some of the help and intervention, being diagnosed as an adult has made the diagnosis a very positive thing for me, I couldn’t change the struggles I had as a child so there was no point wishing it to be any different or wondering why nothing was done and so I resolved to make things the best I could from that point onwards. I seem to be doing pretty well and I now want to help others through raising awareness and offering what support I can. I look at having Asperger’s not as something that creates difficulties but something that means I have to work a little harder in other areas by looking at it like that it helps me feel in and regain control when things get hard. I also never compare myself to others, I only compare the difference in myself as a measure of my own improvement – I just want to be the best I can be in whatever I choose to do.